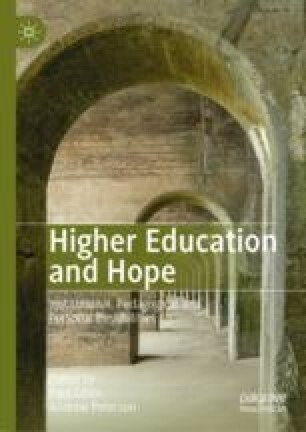 Much has been written about the inscription of neoliberalism into higher education. Replying to how neoliberalism is constructed within the academy, this chapter explores emancipatory imaginaries that provide metaphorical space and time for scholars to experience fun, creativity, the beauty of nature, and a slowing of time, among other pleasures of scholarship. In these theoretical spaces, professional responsibility is forged. Praxis is unique to each professor’s and student’s lifeworld. Theories of knowledge construction that begin with critical thinking and explore postmodern concepts such as “situated knowledges” can be exciting for those who experience them for the first time. Environmental responsibility can be inspired by the reading of texts or visits by activists that bring together activism for equity and environmentalism. Most uplifting is the political will that develops with the engagement of contemporary theorists turning the gaze towards the decolonization of Eurocentric, and recognition of Indigenous, knowledges. Examples here provide a glimpse of how everyday activism is sparked by social theory and how engagement with social theory can infuse hope and well-being. We can take strength from scholarly work through engaging with the beauty of the physical and scholarly world, and connecting with intellectual role models and their imaginaries that promote a myriad of enchanting ways to proceed with one’s own lifework. Equity imaginaries resonate with theories of education that promote engagement or caring, everyday/everynight attention to power relations and ethical praxis. They turn away from the monoculture of neoliberalism and maintain long term health, well-being, and hope in the academy.